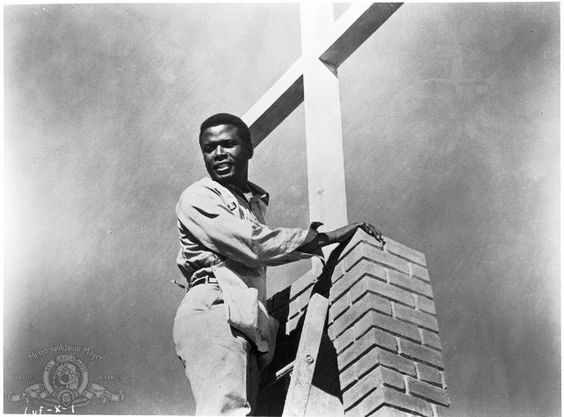 Today, I'm reviewing the inspirational film, Lilies of the Field (1963), starring Sidney Poitier as an itinerant carpenter who helps a group of nuns build a chapel. 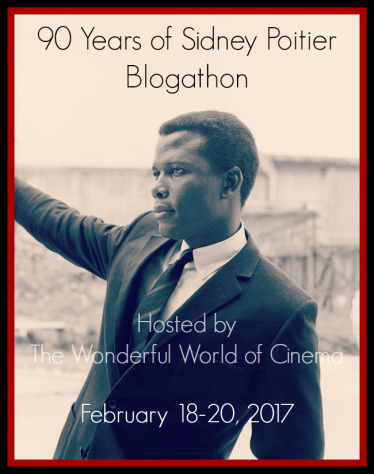 This article is part of the 90 Years of Sidney Poitier Blogathon hosted by The Wonderful World of Cinema. Watching the inspirational film, Lilies of the Field (1963), is a great way to celebrate Sidney Poitier's 90th birthday. The old Hollywood legend, who was born Feb. 20, 1927, gives a funny, charismatic, and ultimately touching performance that earned him the first best actor Academy Award for a black man. Lilies of the Field tells the story of Homer Smith (Poitier), an itinerant carpenter who stumbles across a convent of impoverished nuns in the Arizona desert. Homer hangs around for awhile to help the sisters out with odd jobs in exchange for meager meals, but, unbeknownst to him, the mother superior (Lilia Skala) has other ideas. She believes Homer is sent by God to build a chapel where local Catholics can worship, and soon the bemused carpenter is laying bricks and pounding nails in the scorching Southwest sun. Lilies of the Field is based on a 92-page novella by William Edmund Barrett that captured the imagination of producer and director Ralph Nelson, who had just come off the successful film version of Requiem for a Heavyweight (1962). Nelson approached United Artists about making the film, but they were only willing to put up $250,000, so Nelson put up his own house as collateral to ensure the movie was made, and he and assistant director Joe Popkin fashioned a rigorous 14-day shooting schedule in and around Tuscon, Ariz., that would bring the film in on time and on budget. Next, Nelson had to find a suitable actor for the lead role. Although Homer is an African-American man in Barrett's story, many producers might have been tempted to ignore that plot point in favor of casting someone like Paul Newman or Steve McQueen; however, Nelson's belief in Barrett's simple tale was so strong that he only pursued Poitier for the role. After a few rounds of salary negotiations, Poitier agreed to play Homer in what was one of the most fortuitous decisions in the actor's distinguished career. Lilies of the Field opened to little fanfare in October 1963, but the simple tale of faith and tolerance struck a chord with both audiences and critics alike. 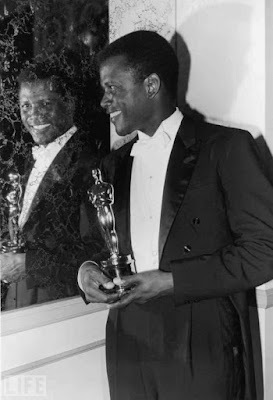 The film received five Oscar nominations, including best picture and best supporting actress for Skala, and a joyous Poitier took home the best actor statue over stiff competition from Albert Finney for Tom Jones and Paul Newman for Hud. Sidney Poitier with his Academy Award for Lilies of the Field (1963). Lilies of the Field not only captured the sixties zeitgeist for nuns -- in addition to Julie Andrews in The Sound of Music (1965), there was Sally Field in the TV show, The Flying Nun, and the unexpected pop hit, Dominque -- but the movie also became a much-needed tonic for a nation in turmoil. Lilies of the Field was playing in theaters both during and after the assassination of President John F. Kennedy, but it also had a broader message that speaks to both the Civil Rights struggles of the 1960s and our own tumultuous times. Lilies of the Field never overtly mentions race or ethnic identity, but it does show people of different cultures, different faiths and even different nationalities -- the nuns are refugees from Communist East Germany -- putting aside their differences to work together for a common goal. Homer is a Baptist who will never worship in the nun's chapel, and local businessman, Juan (Stanley Adams), isn't really religious at all, but that doesn't stop them from dedicating considerable time and energy to a project that will benefit their friends and neighbors. Lilies of the Field also made the traditional spiritual,"Amen," a huge pop hit. I'll leave you with this clip of Poitier (his singing voice is dubbed by Jester Hairston) performing the song with the sisters. A very happy 90th birthday to Mr. Poitier! Lilies of the Field will air at 8 p.m. April 30 on TCM. It is also available for streaming for DirecTV subscribers. Also on DVD and video on demand. A classic - both the movie and your tribute. Thanks! I hope people will take the time to watch this wonderful film. I love it when they sing Amen! Excellent and informative review! I honestly could see Paul Newman in the role, but now I think it really belongs to Sidney Poitier. Thanks again for joining the blogathon! I think everyone's favorite part of that movie is Amen. Thanks for sharing all your behind-the-scenes research. Making a film in 14 days is remarkable. If you can pull it off, it shows you have the right cast and the right location, no? Great post! I recently watched this film with my grandma and we both loved it. The message is inspirational and timeless. And I'm glad nobody chose to make Homer a white man in the film.